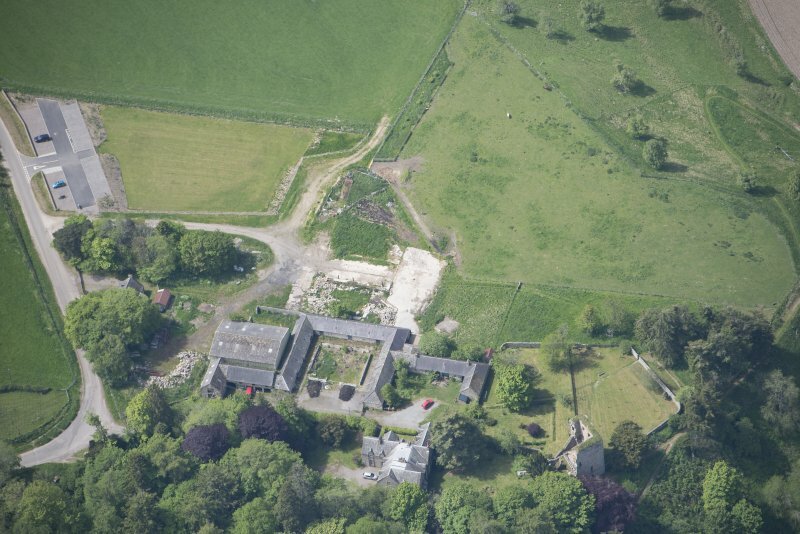 Oblique aerial view of Drumin Castle and Drumin Farmstead, looking SW.
Oblique aerial view of Drumin Castle and Drumin Farmstead, looking ESE. Drumin Castle. General view from SE. Oblique aerial view of Drumin Castle and Drumin Farmstead, looking S.
Oblique aerial view of Drumin Castle and Drumin Farmstead, looking W.
Oblique aerial view of Drumin Castle, looking NE. 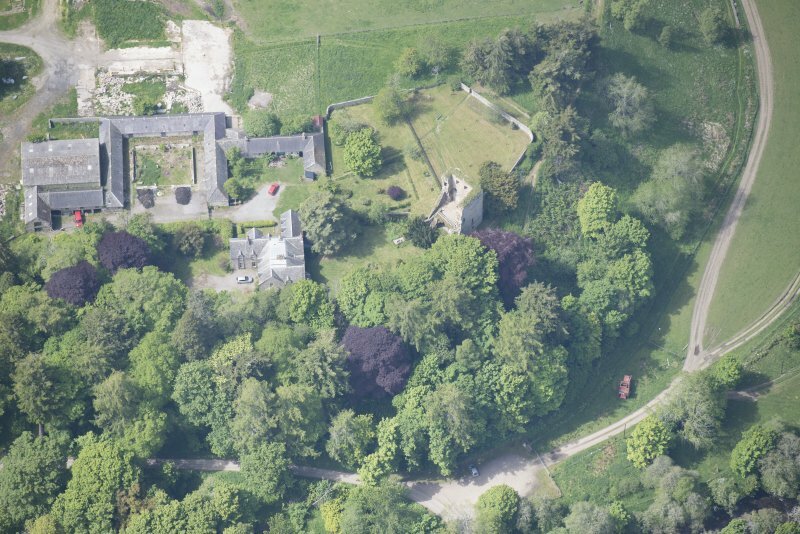 Oblique aerial view of Drumin Castle and Drumin Farmstead, looking SE. 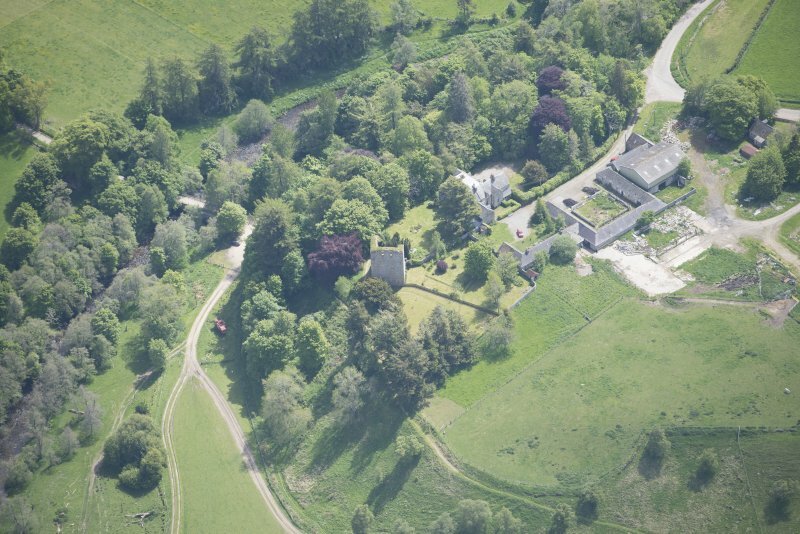 Oblique aerial view of Drumin Castle, looking E.
Oblique aerial view of Drumin Castle and Drumin Farmstead, looking SSE. 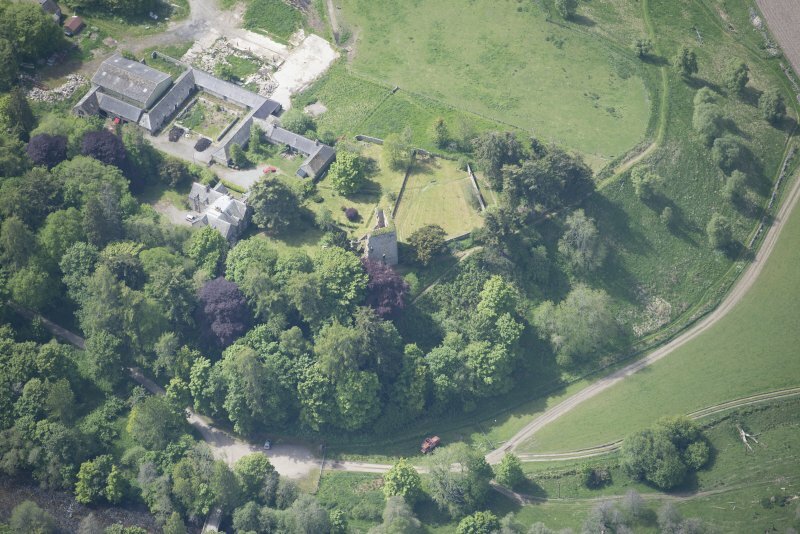 Oblique aerial view of Drumin Castle and Drumin Farmstead, looking WSW. 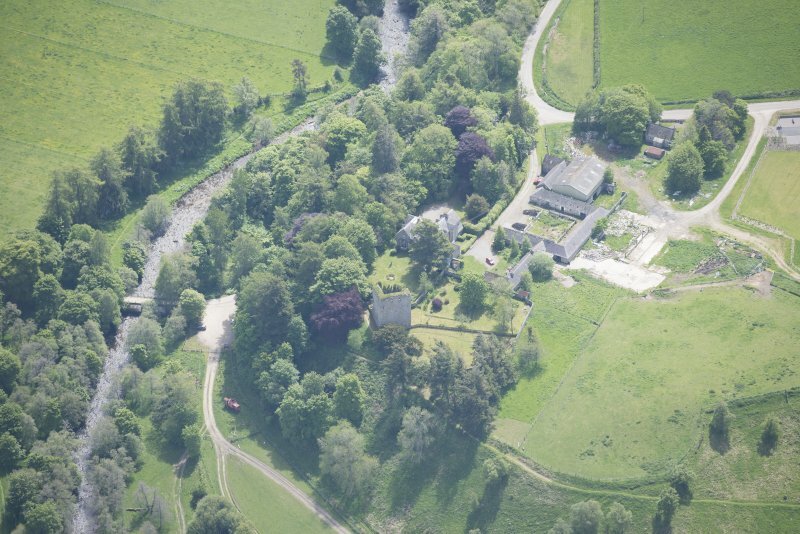 Oblique aerial view of Drumin Castle and Drumin Farmstead, looking SSW. 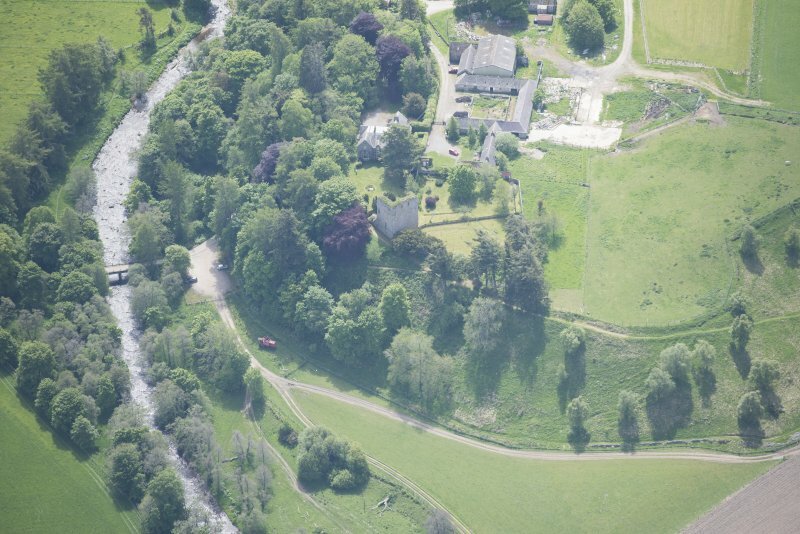 The ruins of Drumin Castle lie on a prominent bluff overlooking the confluence of the Rivers Avon and Livet, a site which commands views of three valleys and once dominated the approach toward Speyside. Erected in the fourteenth century, Drumin Castle was the centre of the lordship of Inveravon and may have been erected by Alexander Stewart, the infamous 'Wolf of Badenoch'. On plan, the castle would have been rectangular, with walls almost 3m thick at the base. Two walls remain to a height of four storeys, probably close to their original heights, and retain evidence of the parapet corbelling and a machicolation (a projecting slot). 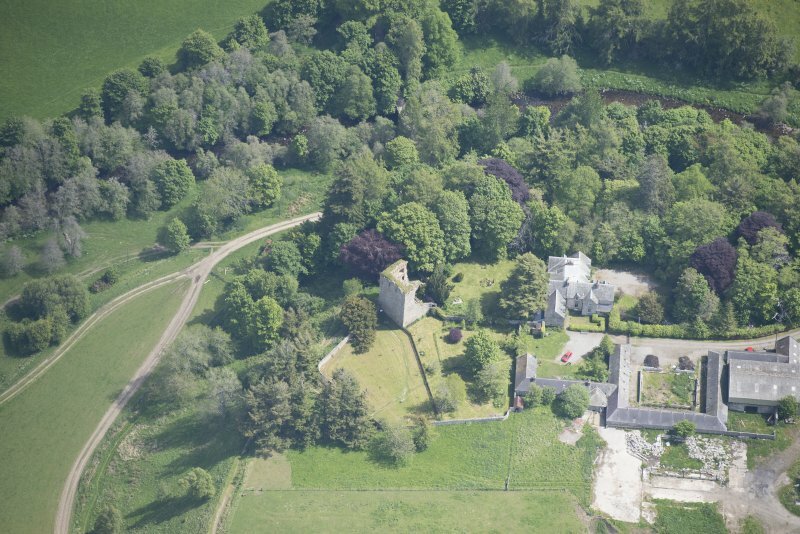 Although an impressive fortification on a commanding site, Drumin Castle appears to have had a relatively short period of occupation, and, following its sale to the 3rd Earl of Huntly in 1490, became derelict within a century. For adjacent farmhouse and farmsteading, see NJ13SE 23.00. 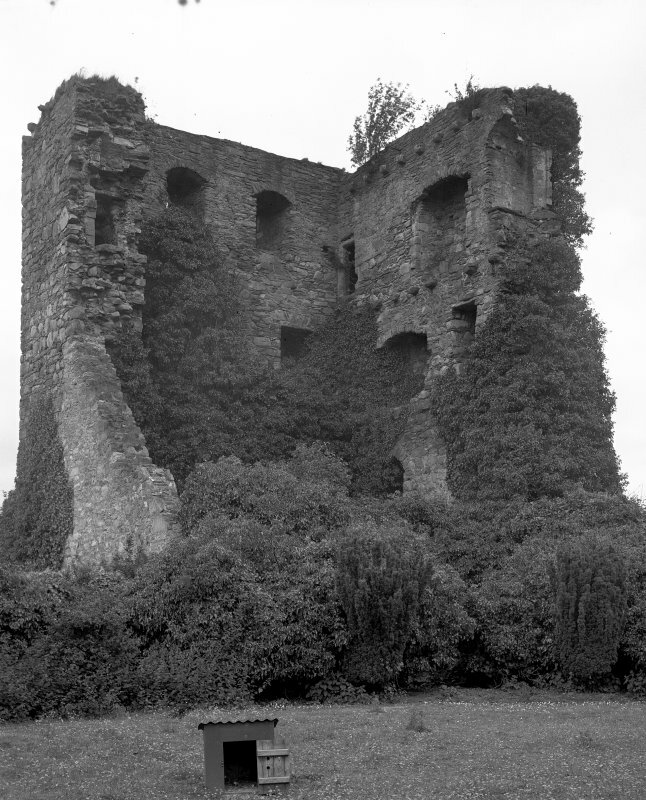 (NJ 1843 3034) Drumin Castle (NR) (In Ruins). The remains of a 14/15th century tower. D MacGibbon and T Ross 1887-92; V G Childe and W D Simpson 1954. The ruins of Drumin Castle as described by the authorities. Visited by OS (N K B) 30 August 1968. The remains of the 14th-century tower-house of Drumin Castle are situated above the confluence of the Avon and Livet, a short distance NW of the garden of Drumin Farm (NJ13SE 23.00). It is relatively well-preserved, survival up to parapet level being unusual in a tower of this date. The tower formed the seat of the barony of Inveravon, and was probably built either by Alexander Stewart, the Wolf of Badenoch and third son of of Robert II, or by Alexander's illegitimate son, Sir Andrew Stewart. 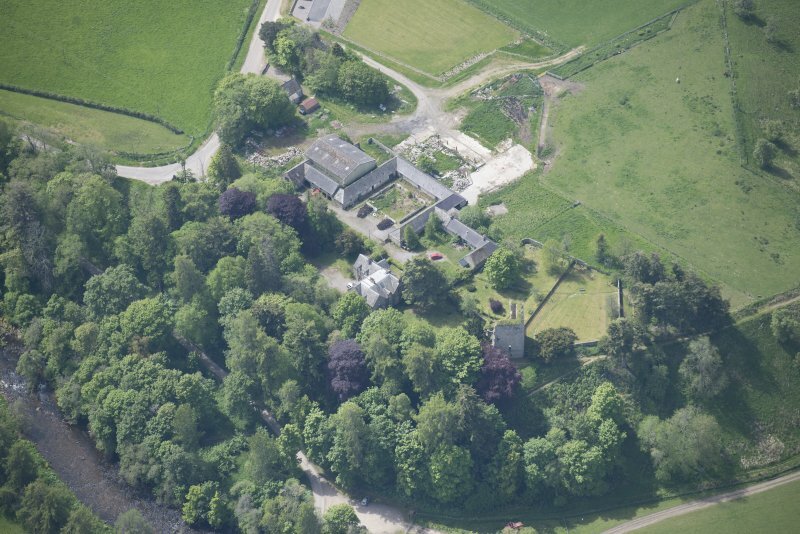 Andrew's son, Sir William, later sold the estate to the Gordons, who moved the seat to Blairfindy Castle (NJ12NE 4). 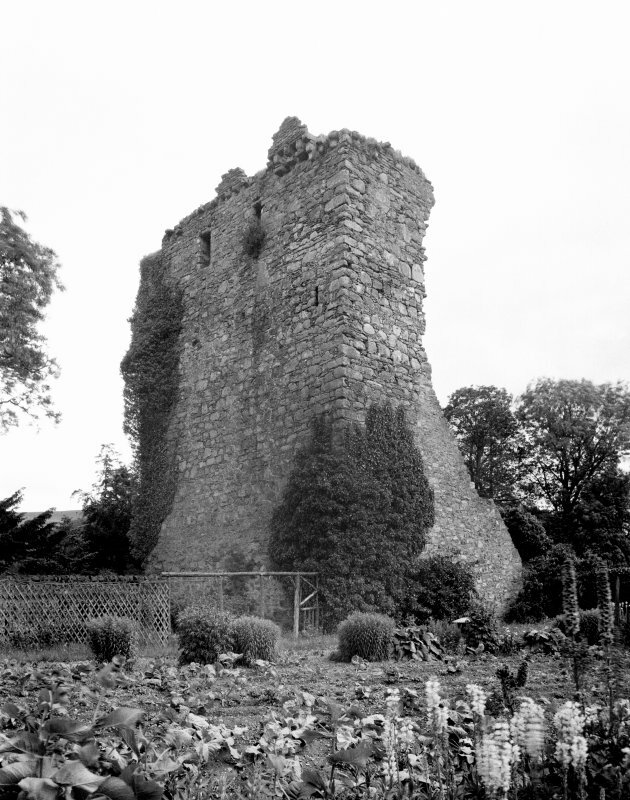 The tower was abandoned in the 16th century and appears to have fallen quickly into disrepair, many of the stones probably being robbed for the construction of nearby buildings, including the farm; the SE end must have collapsed and was subsequently dismantled down to the basal courses. The building measures 11.3m in width with walls 2.8m thick at ground level and about 2.2m thick above the vaulted cellar. Only about 11m length of the SW wall survives and the SE wall (which probably originally contained separate entrances to the cellar, the first-floor hall and the staircase) is missing. The position of the original SE wallwas blocked by a more recent structure and a set of stairs at the S corner was constructed from the exterior up to the first floor. Most of the NE wall and all of that on the NW still stand to a height of four storeys and there are corbels for the former parapet, only a fragment of which remains; the NE wall is 16.2m long and probably represents the full original length of the tower. The cellar measures about 11m long by 6m wide and has three slit windows, four of which are blocked; the rounded barrel vault survives across the NW two-thirds of the area while within the SE third of the cellar there was a mound of stone rubble. Underneath the vault, the ground has been cleared and used for timber-storage and keeping animals. The first floor, on top of the vault, survives to about 6.5m long and 7.5m wide; the large patched area on the interior of the NW wall may indicate the position of the hall fireplace. Underneath the thick ivy that covers this wall there is an upright timber beam set into the stonework, and attached to this a horizontal cross-piece can be seen about 2m from the floor running behind the patching of the possible fireplace. The second, third and attic floors were supported on joists. The second floor had a round-backed fireplace in the NE wall with a slit window to the SE; Salter suggests that there is a latrine in the S corner, but this feature is more probably the access to an intramural staircase to the upper floors. The third floor has a fireplace (probably a later addition) with a roll-moulded surround in the NE wall, two windows in the NW wall, and a latrine in the N corner. The roof would have been supported on the wall-head. Corbelling survives at the top of the NW wall, with several drainage-chutes and what may be machicolation, while two lengths of parapet survive to a height of three or four courses. 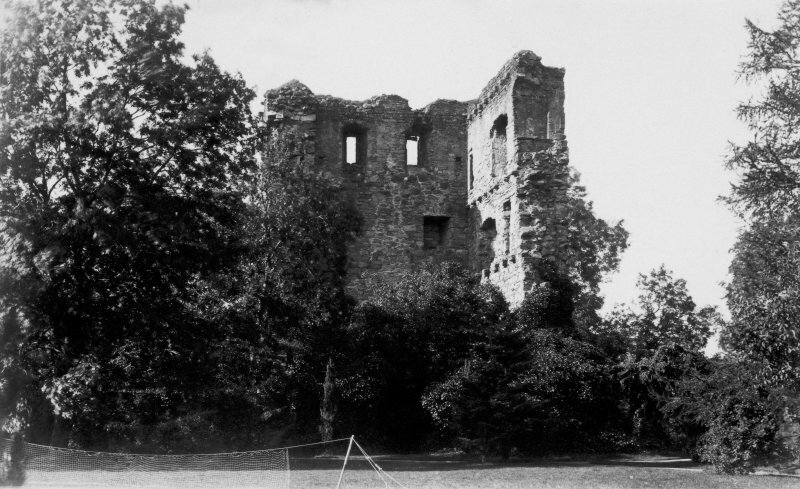 In the 19th or 20th century, the tower was used as a store, a sloping roofed structure being built at the SE end. This store comprised two small rooms separated by an entrance-gap about 2.6m broad which led into the remains of a cellar and would have been closed by the iron gate that was found lying in the rubbish in the cellar. The rest of the tower was possibly consolidated at this time, and the stair leading to the first floor constructed while the sloping roof was built to cover both the new structures and the gap between them and the broken vaulting. The W room of the new structure contained doorways giving access to the interior of the cellar and onto the stairs to the first floor. The E room contained a gap (0.55m wide, 0.5m high and covered by a lintel) in its NW side, as well as a sloping flue built into the upper part of the SE wall. The lack of a fireplace suggests that this flue was constructed for a stove or boiler with a built-in chimney pipe. 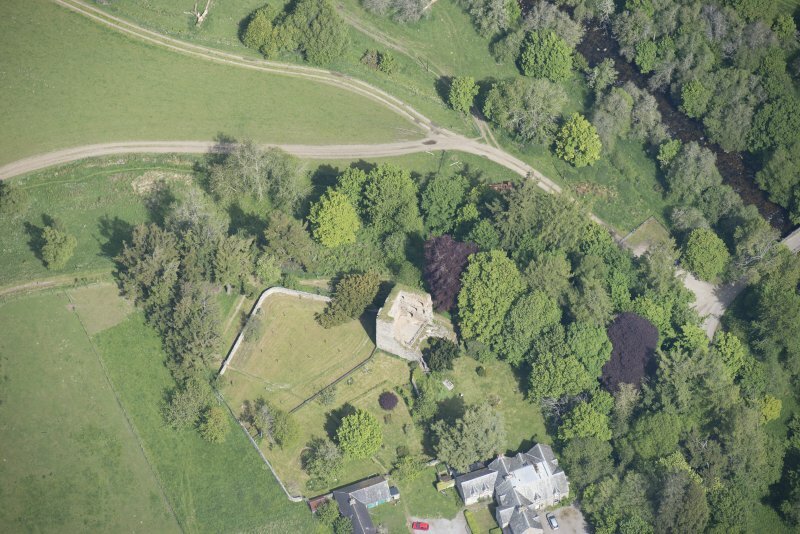 It was possibly also at this time that the remains of the tower were incorpoarated as a 'romantic ruin' into the garden features of Drumin farm (NJ13SE 23.00), yew trees being planted on the SE side and the growth of ivy being encouraged. The construction of the farmhouse and its gardens may have removed or levelled any outbuildings or barmkin wall on all sides but the NE, where the possible roof-raggle at first-floor level suggests a possible structure in the level space (about 10m wide) between the tower and the steep slope to the river. A slight mound beneath the garden wall that abuts the NW side of the tower has been thought to represent the remains of an earlier enclosure wall. Excavation was carried out (by EUCFA) in March and July 1996 to investigate deposits in the cellar and first floor of the tower and in its immediate surroundings in advance of consolidation work. Before excavation, the archaeological potential of the monument was thought to be low, the cellar having been cleaned-out and reused while the first floor was covered with ivy and had only a thin depth of soil. In the event, no 14th-century deposits were discovered, all those found being attributed to 19th- and 20th-century reuse and subsequent consolidation works. The concrete floor that was found above the floor supporting the first floor has been attributed to the original consolidation in the 1940's. Hand-augering within the cellar showed the loose soil to be between 0.15 and 0.25m deep and to overlie a deposit which was possibly of natural origin. NJ 1843 3034. 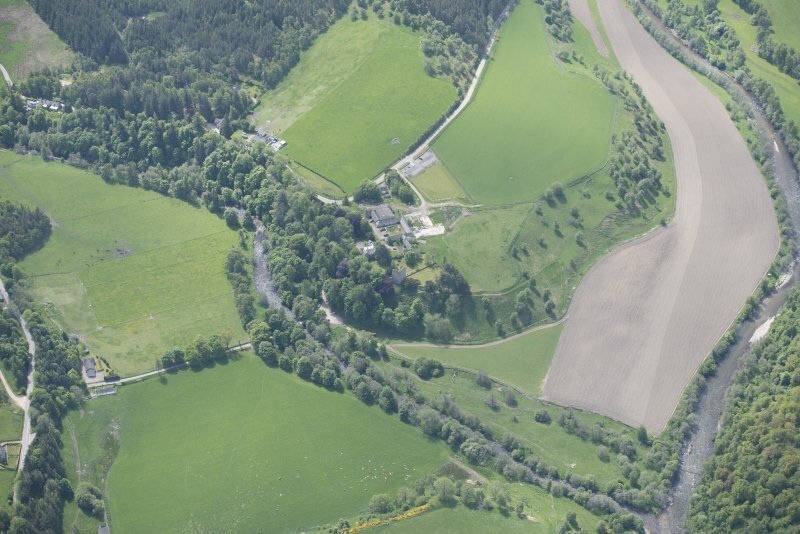 An archaeological excavation was carried out at the 14th-century tower of Drumin Castle in Glenlivet in advance of a proposed programme of consolidation work. The excavations confirmed that no significant archaeological deposits, contemporary with the use of the 14th-century tower as a lordly residence, survived in situ. All the excavated deposits appear to relate to 19th and 20th-century reuse of the tower and its subsequent consolidation as a Guardianship site between 1948-1957. The ground floor had been cleared out for use as a timber store and for rabbit hutches, removing all deposits to below the foundation level. Excavation on the first floor, above the vault, revealed a concrete floor constructed as part of the initial consolidation of the tower probably in the 1940s. Two small trial trenches in the vicinity of the castle did not locate any archaeologically significant remains associated with the occupation of the tower. Sponsor: Law & Dunbar-Nasmith on behalf of the Crown Estate.